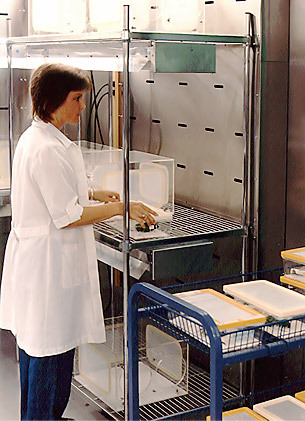 EGC provides entomological research chambers specially designed for the propagation and study of insects. In this unique design air is drawn across the shelves assuring uniform flow, temperature, and relative humidity on the shelves, where it is needed the most. These chambers are comprehensively engineered systems, providing precise control of a wide range of environmental climate conditions, each within close limits. Each room is a combination of sub-systems, integrated into a true research chamber. Airflow is introduced into the room through a pressurized ceiling plenum, then drawn over each shelf into slotted wall return ducts. Particulate air filters are located on the inlet side of the evaporator coils.